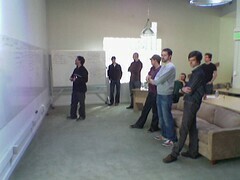 Later, each group presented their ideas, and a few of them were selected for prototyping. Demos ensued. @Jack’s idea rose to the top as a combination of status-type ideas. 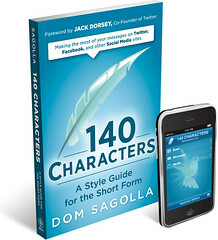 @Jack, @Biz, and @Florian were assigned to build version 0.1, managed by @Noah. The rest of the company focused on maintaining Odeo.com, so that if this new thing flopped we’d have something to fall back upon. We struggled with a codename and a product name. “It’s FriendStalker!” joked @Crystal, our most prolific user. The userbase was limited entirely to the company and our immediate family. No one from a major company of any kind was allowed in. For months, we were in Top Secret Alpha because of competing products like the now-defunkt Dodgeball. The original product name / codename “twttr” was inspired by Flickr and the fact that American SMS shortcodes are five characters. We prototyped with “10958” as our shortcode. (We later changed to “40404” for ease of use and memorability.) @Florian was commuting from Germany, so in order to operate with him we secured a “long code”, or a full 10-digit phone number linked to a small-potatoes gateway. Twttr probably had about 50 users in the 10958 days. I was following everyone on the system. We had an admin page where you could see every user. As Head of Quality for the company, it seemed like my duty to watch for opinions or issues from our users. This caused confusion, though, when family members of our team were suddenly being followed by a seemingly random person. Thus, Private Accounts were born. @Jack and @Florian created a means for users to mark themselves private, and we admins had the ability to tell who wanted to be private so we’d know not to follow them. Actual, real privacy with secure protection came a bit later. I’d say there were about 100 users when Private was invented. The interaction model and the visual metaphor for the service were constantly in flux. The meaning of being someone’s “Friend” versus “Following” someone changed regularly. At that point, you could either get all SMS messages or get none. There was no Twictionary back then; data in the system were referred to as “posts” or just “messages”. The lack of clear terminology led to some pretty spirited debates leading up to the Spring of 2006. We launched Twttr Beta on @Ev’s birthday. We could now invite a slightly larger circle of friends, but still excluding any large companies (with a few trusted exceptions within places like Google). I’ll never forget the family-friendly feeling of that day. We all knew that we were going to change the world with this thing that no one else understood. That day stands out in memory as the deep breath before a baby’s first cry. Meanwhile, Odeo and the corporate board were at a tension point. Not only was the value of Twttr difficult to describe, the relevance of Odeo was declining monthly. Drastic cuts were recommended. One day in early May 2006, @Ev let four of us go: @Adam, @TonyStubblebine, me, and @Rabble. @Noah and @TimRoberts would later be asked to leave as well. It was a tough decision and huge shock to each of us. We all handled it differently. Looking back on it, I think Twitter allowed us to stay connected when we might not have otherwise been. After all, we weren’t even public with the site yet, so each of us continued to add value just by using it with each other. During this transition, Twttr.com launched to the public. Still, very few people understood its value. At the time most people were paying per SMS message, and so wouldn’t Twttr run up our bills? Also, how were we supposed to use this thing and who cares what I’m doing? Each one of us original users became a kind of personal evangelist for Twttr, trying to get our coworkers and friends to use it. At this point, Obvious Corp was born as an incubator with Twttr as its sole project. Just in time for SxSW, @RayReadyRay rigged a very sweet Flash-based visualizer that ended up on display on the halls of the conference. I wasn’t working there, but I used to visit regularly to see how our baby was doing. I happened to be at the office in SF when the visualizer went live on site in Austin. I remember finding a bug just before showtime, as @Biz and @Jeremy talked over the phone. Everything miraculously fell into place by the time people filtered out of the sessions to see their comments floating along the hallway screens. Boom #1: Twitter won an award in the Blog category, and @Jack thanked everyone in 140 characters. Apple WWDC 2007, and then TV, and then print and pretty soon Cable news: Boom #3. @Jack became the CEO of a newly spun-off Twitter, Inc. during the Boom Times. People still didn’t quite “get it” but at least some people had heard about it. The team created permalinks and RSS feeds. @Blaine pushed for IM integration. Each major feature added tremendous gains in users, and in usage per user. Still small by social networking standards, Twitter delivered something immediate and vital that no other service could attain. For a lot of people, the entire API launch was really the time when Twitter first left the nest. But that is another story, for another time. 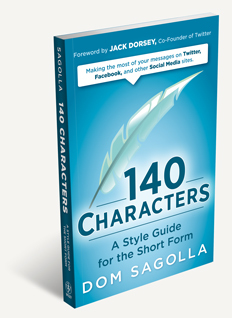 Update: An expanded form of this History is now available as the Introduction to “140 Characters: A Style Guide for the Short Form”.